Chronicling the lives of a multi-generational cast within the British-Asian community, the reality series was filmed in West London in suburbs such as Southall, Harrow and Gerrards Cross, which are home to rich and diverse populations. Shot just days before transmission, Desi Rascals told the stories of a modern, dynamic and aspirational group of characters across a range of ages as they navigated their social, professional and family lives in a fast changing community. "It’s unscripted, so different to what I normally do. I haven’t written these characters - in Desi Rascals we have real people who have brilliant spontaneous exchanges that I could never write. 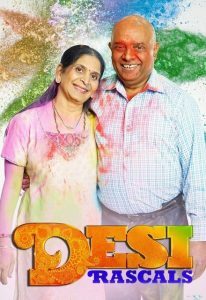 What Desi Rascals offers is a massive burst of energy, storytelling and characters that would take me years to put together if I was making a movie. It’s very important to me that the parents and grandparents are present as much as the kids. Having older generations in our show allows us to show how the pressures on that generation are as important as those of the younger people. Parents sometimes put pressure on their kids, but there’s also pressure on them because they want to do the best for their kids as well as upholding certain traditions and values, which is where the tension and drama really comes from."